Allows you to add or release air from a bladder so that you can adjust your buoyancy. This lets you float, hover or descend slowly at will. 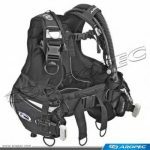 The BCD is, or integrates with, the harness that holds the scuba tank on your back and unites components into a single scuba unit. 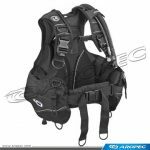 Also known as : buoyancy compensator, buoyancy compensating device, BC, vest, jacket, BC jacket, wings, backmount BC. Over its evolution, there have been several BCD design styles and types. Today, there are two primary styles you’ll see most commonly. 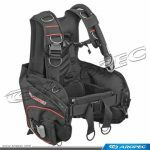 BCD jacket – The most popular style in recreational diving, this style BCD combines the harness and air bladder into a single compact, sleek unit. The bladder is primarily along your back, but sweeps forward under your arms for balance when inflated at the surface. Wings/harness – This system uses a bladder that sandwiches between the harness and the tank. Although most commonly used with twin cylinders in tec diving, they’re also used in mainstream recreational diving. Adjustable band – Holds scuba tank on your back and allows you to quickly change tanks between dives. Low pressure inflator/deflator – Allows you to add air from your cylinder via the regulator to the BCD at touch of a button. You similarly release air by pressing another button. You usually find this on the end of a large diameter hose, though a few models incorporate these elsewhere. Overpressure valve – Lets air out of the BCD so it won’t rupture the bladder of the BCD if accidentally overinflated. Pockets – Allow you to carry accessories out of the way. Cummerbund waistband – Provides more comfort around the waist. Quick dump – Convenient exhaust valves that let you release air without holding the inflator mechanism up. D-rings – Provide places to clip accessories to free your hands while diving. Integrated weight system – Eliminates a separate weight belt and most divers find this a more comfortable way to wear weight. Alternate inflator regulator – Combines your alternate second stage with the BCD inflator. You’ll choose your BCD based on the uses you plan for it. Besides fit, Expedition Dive can help you choose the features you want. Try the BCD on for size. It’s best to do this wearing your exposure suit, but not absolutely critical as long as there’s ample room for adjusting it after finding a comfortable fit. Bring your regulator so we can be sure you have the correct hoses, hose placement and that you can secure all your hoses and accessories where you want them. Bring all the accessories and surface signaling devices you carry with you as standard equipment to be sure you like where you carry them with the BCD. Lower capacity, compact BCDs are great for warm water, tropical diving, but standard capacity BCDs work equally well and are more versatile for a range of dive environments. A BCD with multiple quick dump exhaust valve allows you to adjust your buoyancy without having to change position while swimming. Take the PADI Peak Performance Buoyancy course to learn how to optimize your weighting, streamline and control your buoyancy.